For other uses, see Vaucluse (disambiguation). Vaucluse (French pronunciation: ​ [vo.klyz] ; Occitan : Vauclusa in classical norm or Vau-Cluso in Mistralian norm) is a department in Southeastern France, located in the Provence-Alpes-Côte d'Azur region. It is named after the famous spring, the Fontaine de Vaucluse; the name Vaucluse itself derives from the Latin Vallis Clausa ("closed valley") as the valley ends in a cliff face from which emanates a spring whose origin is so far in and so deep that it remains to be defined. 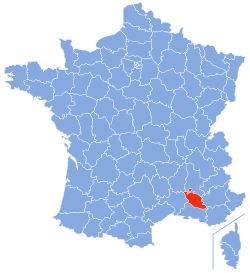 The department's prefecture is Avignon; it had a population of 559,014 as of 2016. Occitan, also known as lenga d'òc by its native speakers, is a Romance language. It is spoken in southern France, Italy's Occitan Valleys, Monaco, and Spain's Val d'Aran; collectively, these regions are sometimes referred to as Occitania. Occitan is also spoken in the linguistic enclave of Guardia Piemontese. However, there is controversy about the unity of the language, as some think that Occitan is a macrolanguage. Others include Catalan in this family, as the distance between this language and some Occitan dialects is similar to the distance among different Occitan dialects. In fact, Catalan was considered an Occitan dialect until the end of the 19th century. Vaucluse was created on 12 August 1793 out of parts of the departments of Bouches-du-Rhône, Drôme and Basses-Alpes, later renamed Alpes-de-Haute-Provence. The then rural department was, like the nearby city of Lyon, a hotbed of the French Resistance in World War II. Bouches-du-Rhône is a department in Southern France named after the mouth of the river Rhône. It is the most populous department of the Provence-Alpes-Côte d'Azur region with 2,019,717 inhabitants in 2016; it has an area of 5,087 km2 (1,964 sq mi). Its INSEE and postal code is 13. 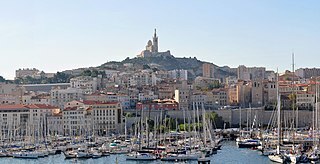 Marseille is Bouches-du-Rhône's largest city and prefecture. Drôme is a department in Southeastern France, located in the Auvergne-Rhône-Alpes region. It is named after the Drôme River; it had a population of 508,006 as of 2016. Drôme's prefecture is Valence. Alpes-de-Haute-Provence is a department in Southeastern France, located in the Provence-Alpes-Côte d'Azur region. Formerly part of the province of Provence, it had a population of 161,916 in 2013. Its main cities are Digne-les-Bains (prefecture), Manosque, Sisteron, Barcelonnette, Castellane and Forcalquier. Inhabitants of Alpes-de-Haute-Provence are called the Bas-Alpins or Bas-Alpines referring to the department of Basses-Alpes which was the former name of the department until 1970. 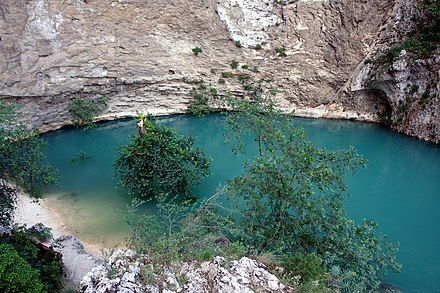 The Fontaine de Vaucluse is the source of the Sorgues. It is characterised by an upward movement of water from the depth of over 315 metres (1,033 ft). Vaucluse is bordered by the Rhône to the west and the Durance to the south. Mountains occupy a significant proportion of the eastern half of the department, with Mont Ventoux (1,912 m), also known as "the Giant of Provence", dominating the landscape. Other important mountain ranges include the Dentelles de Montmirail, the Monts de Vaucluse and the Luberon. Fruit and vegetables are cultivated in great quantities in the lower-lying parts of the department, on one of the most fertile plains in Southern France. The Vaucluse department has a rather large exclave within the Drôme department, the canton of Valréas (Enclave des Papes). The Rhône is one of the major rivers of Europe and has twice the average discharge of the Loire, rising in the Rhône Glacier in the Swiss Alps at the far eastern end of the Swiss canton of Valais, passing through Lake Geneva and running through southeastern France. At Arles, near its mouth on the Mediterranean Sea, the river divides into two branches, known as the Great Rhône and the Little Rhône. The resulting delta constitutes the Camargue region. The Durance is a major river in south-eastern France. Mont Ventoux is a mountain in the Provence region of southern France, located some 20 km northeast of Carpentras, Vaucluse. On the north side, the mountain borders the Drôme département. At 1,909m, it is the highest mountain in the region and has been nicknamed the "Beast of Provence", the "Giant of Provence", or "The Bald Mountain". It has gained fame through its inclusion in the Tour de France cycling race; in 2009 it was the scene of the first penultimate-day mountain top finish in the Tour de France, with Alberto Contador sealing his yellow jersey. Vaucluse is also known for its karst, including the karst spring Fontaine de Vaucluse after which "Vauclusian Risings" are named. Important urban centres include Avignon, Orange, Carpentras, Cavaillon and Apt. Karst is a topography formed from the dissolution of soluble rocks such as limestone, dolomite, and gypsum. 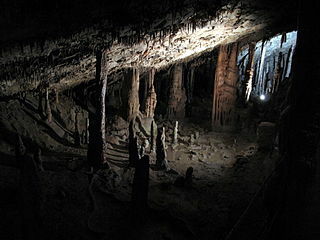 It is characterized by underground drainage systems with sinkholes and caves. It has also been documented for more weathering-resistant rocks, such as quartzite, given the right conditions. Subterranean drainage may limit surface water, with few to no rivers or lakes. However, in regions where the dissolved bedrock is covered or confined by one or more superimposed non-soluble rock strata, distinctive karst features may occur only at subsurface levels and be totally missing above ground. A karst spring is a spring that is part of a karst system. That includes the underground drainage of a much larger area, which means that karst springs often have a very large discharge. Because of their often conical or bowl shape, such water sources are also known in German-speaking lands as a Topf ("pot") which is reflected in names such as Aachtopf or Blautopf. Avignon is a commune in south-eastern France in the department of Vaucluse on the left bank of the Rhône river. Of the 90,194 inhabitants of the city, about 12,000 live in the ancient town centre enclosed by its medieval ramparts. Following the 2015 departmental election, Maurice Chabert of The Republicans was elected President of the Departmental Council. He succeeded Claude Haut, a member of the Socialist Party, who had held the office since 2001. Departmental elections to elect the membership of the Departmental Councils of France's 100 departments were held on 22 and 29 March 2015. In 2015 for the first time, the term "departmental elections" replaced "cantonal elections", and the term "Departmental Council" replaced "General Council". The departmental councils of France are assemblies of the departments, elected by universal suffrage. Prior to the French departmental elections, 2015 they were called general councils. The Departmental Council of Vaucluse has 34 seats. The Left Front (FG) currently has 2 seats, the Socialist Party (PS) has 7, Europe Ecology – The Greens (EELV) has 3, the miscellaneous right (DVD) has 2, The Republicans (LR) have 10, the National Rally has 6 and a local party, the Ligue du Sud (LS), has 4. The Left Front was a French electoral alliance and a political movement created for the 2009 European elections by the French Communist Party and the Left Party when a left-wing minority faction decided to leave the Socialist Party, and the Unitarian Left, a group which left the New Anticapitalist Party. The alliance was subsequently extended for the 2010 regional elections and the 2012 presidential election and the subsequent parliamentary election. Europe Ecology – The Greens is a green centre-left political party in France. The party was formed on 13 November 2010 from the merger of The Greens and Europe Ecology. Vaucluse's 1st constituency Jean-François Cesarini La République En Marche! Vaucluse's 3rd constituency Brune Poirson La République En Marche! On 21 July 2017, Poirson resigned from office to join the Second Philippe government as Secretary of State to the Minister for the Ecological and Inclusive Transition. She was replaced in the National Assembly by Adrien Morenas. Orange is a commune in the Vaucluse Department in the Provence-Alpes-Côte d'Azur region in southeastern France, about 21 km (13 mi) north of Avignon. It has a primarily agricultural economy. The Dentelles de Montmirail are a small chain of mountains in Provence in France, in the département of Vaucluse, located just to the south of the village of Vaison-la-Romaine. The arrondissement of Avignon is an arrondissement of France in the Vaucluse department in the Provence-Alpes-Côte d'Azur region. Since the January 2017 reorganization of the arrondissements of Vaucluse, it has 17 communes. Crestet is a commune in the Vaucluse department in the Provence-Alpes-Côte d'Azur region in southeastern France. Buisson is a commune in the Vaucluse department in the Provence-Alpes-Côte d'Azur region in southeastern France. Beaumes-de-Venise is a commune in the Vaucluse department in the Provence-Alpes-Côte d'Azur region in southeastern France. Le Barroux is a village and commune in the Vaucluse department in the Provence-Alpes-Côte d'Azur region in southeastern France. It had a population of 615 in 2006. Malaucène is a commune in the Vaucluse department in the Provence-Alpes-Côte d'Azur region in southeastern France. Gigondas is a commune in the Vaucluse département in the Provence-Alpes-Côte d'Azur region in southeastern France. Mirabeau is a commune in the Vaucluse department in the Provence-Alpes-Côte d'Azur region in southeastern France. Monteux is a commune in the Vaucluse department in the Provence-Alpes-Côte d'Azur region in southeastern France. Vacqueyras is a commune in the Vaucluse department in the Provence-Alpes-Côte d'Azur region in southeastern France. Suzette is a commune in the Vaucluse department in the Provence-Alpes-Côte d'Azur region in southeastern France. Sablet is a commune in the Vaucluse department in the Provence-Alpes-Côte d'Azur region in southeastern France. La Roque-Alric is a commune in the Vaucluse department in the Provence-Alpes-Côte d'Azur region in southeastern France. Lafare is a commune in the Vaucluse department in the Provence-Alpes-Côte d'Azur region in southeastern France. 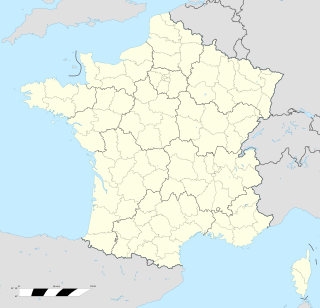 Auvergne-Rhône-Alpes or ARA is a region of France created by the territorial reform of French Regions in 2014; it resulted from the merger of Auvergne and Rhône-Alpes. The new region came into effect on 1 January 2016, after the regional elections in December 2015. The Fontaine de Vaucluse is a karst spring in the commune of Fontaine-de-Vaucluse, Vaucluse department. It is the largest karst spring in metropolitan France by flow, and fifth largest in the world, with annual output of 630,000,000 to 700,000,000 cubic metres (2.2×1010 to 2.5×1010 cu ft) of water. The spring is the prime example in hydrogeology of a "Vaucluse spring". ↑ List of members for Vaucluse (in French), on www.nosdeputes.fr.